Explainer: How could/would Greece leave the eurozone? It’s possible – but it wouldn’t be easy. THE GREEK GOVERNMENT is in turmoil today after French and German leaders issued a stark ultimatum over its future as part of the eurozone. Referring to prime minister George Papandreou’s plan to hold a referendum on the country’s next EU bailout, Angela Merkel and Nicolas Sarkozy made it clear that Greece’s future in the single currency was at stake. But would it be in their power to eject Greece from the euro? And if Greece decided to leave on its own, what would it need to do? Email “Explainer: How could/would Greece leave the eurozone?”. 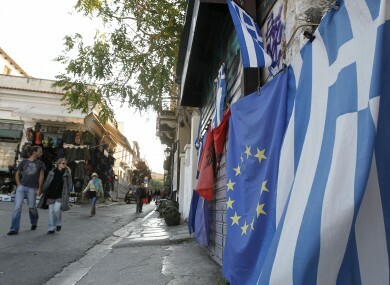 Feedback on “Explainer: How could/would Greece leave the eurozone?”.